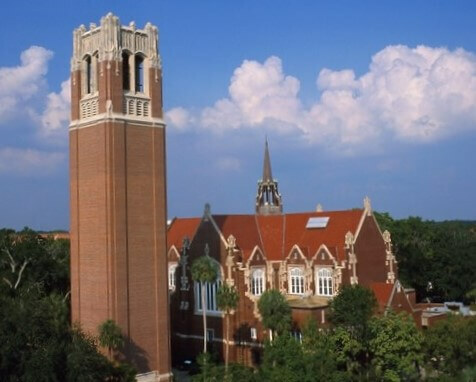 University of Florida history has been one of steady campus population growth and academic and athletic excellence. Gainesville history has advanced hand in hand with that of the university. Like most prime spots in Florida, the land on which Gainesville and the University of Florida now sit was first an Indian village. For centuries, the heavily tattooed and resourceful Timucua flourished in North Florida, harnessing the bountiful lakes, wildlife and rich soils of what is now Alachua County Florida. Beginning in the 16th century, ruthless conquistadors like Hernando de Soto plundered the region, ransacking Timucuan stores and kidnapping women. The Timucua were no cupcakes, but they were no match for Spanish germs, guns and steel. By the 18th century, all the Timucua and most of their Florida bethren were either dead from disease and war or converted by the Franciscan missions that began proliferating in the area. By the late 18th century, the Indians had all perished or had been absorbed into Spanish communities in the Caribbean as Spain began to retreat from La Florida. By 1821, Florida was proving itself to be more trouble than it was worth for Spain. After having endured decades of raids by the British and their Seminole allies, Spain ceded the territory to the United States. Since American settlers were already starting to trickle over the border, it seemed a logical choice to let the gringos deal with the ornery Seminole, or in the Spanish vernacular - Cimarrones (renegades). 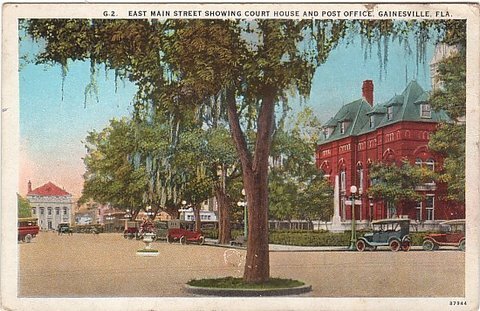 Alachua County, Florida was soon established in 1824. Natives called it then and now "Lotch-A-Way". A huge parcel at the time, it extended from the Georgia border all the way to Tampa Bay. The outbreak of the Second Seminole War slowed progress some, but the arrival of the railroad and statehood brought the area a much-needed growth spurt. When the Fernandina to Cedar Key railroad came to Alachua county, it bypassed the county seat of Newnansville. With its county seat now old hat, Alachuans voted to build a new county seat that would straddle the lifeline of the rails. In 1853, the new township was named Gainesville in honor of Seminole fighter General Edmund P. Gaines. A plantation owner, Major James B. Bailey, sold several acres of his land to be used for the new city. His 1848 house, built by his slaves, still stands today after a complete restoration in the 1980s. Gainesville was constructed using a grid system with numbered streets, which gratefully today makes the city a piece of cake to navigate. By 1860, the population of Gainesville, Florida had reached the whopping number of almost 240 souls. Not a bad figure for what was essentially a frontier town. With the arrival of the Civil War, Gainesville turned into a commissary for the Confederate Army. This status as a supply center made it an attractive target for the Yankees, who twice tried to capture the town but were routed each time by its rebel defenders. During the post-war Reconstruction era, the town became a center for learning when Gainesville Academy united with East Florida Seminary to form a precursor to the University of Florida. The city also saw the area's first African-American school in 1867 when Union Academy was built by newly freed slaves who had been trained as carpenters. By the end of Reconstruction, Gainesville had become a center for cotton, phosphates, lumber and citrus. This economic position helped Gainesville weather the record freezes that destroyed North Florida's orange groves - and many of the communities that depended on them. Like many 19th century towns in Florida, Gainesville soon discovered that wood did not make the best building material in Florida. After a series of fires in 1884 devastated downtown Gainesville, red brick became the standard for new buildings. The city became so enamored with brick that even the town's streets were paved with it. By the early 1900s, the bricklaying behemoth had become Florida's fourth largest city. 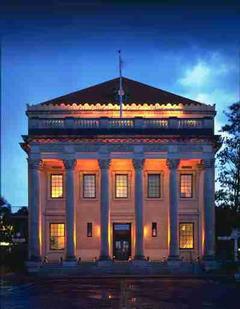 University of Florida history began when the school opened in 1906. The university gave Gainesville another weapon in its economic arsenal. The University drew the city's growth westward, and before long the University (formerly Florida Agricultural College) had absorbed Gainesville Academy and East Florida Seminary. When a boll weevil plague destroyed the cotton industry and phosphates lost their importance after World War I, the University saved Gainesville from certain ruin during the Great Depression. The city and the college exploded when World War II came to a close and thousands of veterans started arriving looking to cash in their GI Bills. University of Florida history before World War II was for men only; women went to Florida State School For Women in Tallahassee. After the war, women were allowed to attend the University of Florida, and Florida State went coed also. For years the ratio of women to men at FSU was very high and a paradise for bachelors. Many former soldiers and their sweethearts used to have romantic trysts at Devils Millhopper, an ancient sinkhole north of Gainesville with magnificent and mysterious vegetation. University of Florida history also includes Century Tower. The brick tower was built in 1953 to commemorate the 100th anniversary of the university and was dedicated to UF students killed in World Wars I and II. 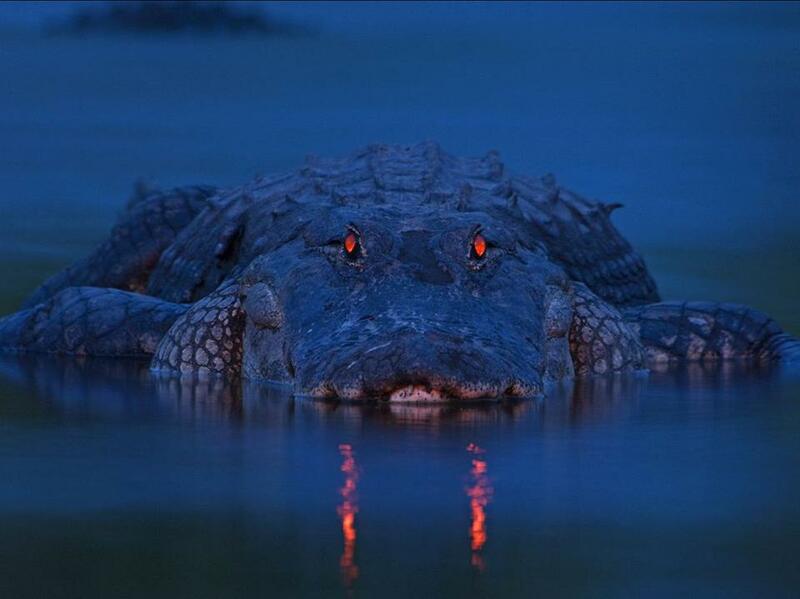 A Gator legend says that if a virgin graduates from the University of Florida, a brick will fall from Century Tower. University of Florida history does not mention any bricks falling from the tower. With expansion came a prestigious medical college, a dental college, and one of the most championed and beloved football teams in the NCAA, the Florida Gators. No University of Florida history discussion is complete without mention of the creation of Gatorade by University of Florida researchers. The tasty drink brought further fame and fortune to Gainesville. Perhaps the team rally from a grateful town shouldn't be "Go Gators! ", but rather "Don't Go, Gators! ".